ARCTIC CIRCLE -- Divers from U.S. Navy Mobile Diving and Salvage Unit (MDSU) Two, Underwater Construction Team (UCT) One and the U.S. Coast Guard braved harsh Arctic waters to play a critical role during a torpedo exercise as part of Ice Exercise (ICEX) 2018. During the exercise, the Seawolf-class fast-attack submarine USS Connecticut (SSN 22) and the Los Angeles-class fast-attack submarine USS Hartford (SSN 768) each fired several training torpedoes under the ice. Training torpedoes have no warheads and carry minimal fuel. "The primary objective of this year's ICEX is to test new under-ice weapons systems and validate tactics for weapon employment," said Ryan Dropek, Naval Undersea Warfare Center Division Newport, RI Weapons Test Director. "Once the divers recover these torpedoes, we can extract important data about how they perform and react in these conditions." "Once we know the location of the torpedo and drill holes, our divers slip into the water to begin placing weights on a line attached to the tail end of the torpedo," Chief Warrant Officer Michael Johnson, officer-in-charge of MDSU-2 divers, explained. "The weights help shift the torpedo from a state of positive buoyancy to neutral buoyancy under the ice." "To prepare for ICEX, we completed training at the Coast Guard's Cold Water Ice Diving (CWID) course and earned our ordnance handling certification from the Naval Undersea Warfare Center," said Johnson. "Additionally, each unit completed MK48 Torpedo recovery training and Unit Level Training (ULT) classroom training on hypothermia, frostbite, ice camp operations, dry-suit, and cold-water ice diving." "Our Underwater Construction Teams have always had the ice-diving capabilities, so it was awesome to be invited out to this exercise to make sure we're keeping up with something that we say we can do," said Builder 1st Class Khiaro Promise, assigned to Construction Dive Detachment Alfa. During ICEX, the divers conducted dives using two different types of diving methods. UCT-1 and the USCG dove with SCUBA equipment, which provides divers with an air supply contained in tanks strapped to the backs of the divers. The divers equip themselves with a communication "smart rope" which is a protected communication cable to the surface that acts as a tending line so support personnel on the surface has positive control of the divers and so they can quickly return to the dive hole. "We decided to use the DP2 system because it performs in arctic conditions very well," said Navy Diver 1st Class Davin Jameson, lead diving supervisor for MDSU-2. "The ability to change our air supply during the dive is critical and allows us to stay under the water a lot longer." Not only did the divers have an essential role in torpedo recovery, they were also essential to camp operations. 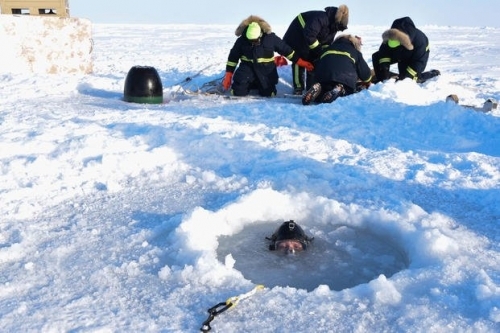 "Prior to torpedo retrieval dives, all the divers on ice helped set up the camp and in the building of two runways (one 1,300 and one 2,500-ft)," Senior Chief Navy Diver Michael McInroy, master diver for MDSU-2. "In the camp, everyone has responsibilities to keep operations on track. The divers worked hard to do their part in and out of the water." "The brotherhood in diving means we have a lot of trust in that other person when you go underwater, and you get close to your coworkers, it's more of a family," Promise said. � Copyright 2018 Navy News.